I want that medal! Achieving against all odds! The full Umgeni river thundered and surged around and over the mighty rocks in Graveyard rapid, as we paddled hard for the finish of 1986 Dusi Canoe Marathon. The rear cockpit of our blue racing K2 kayak was cracked from an earlier spill in the tricky uMzinyathi rapid. Suddenly the brown water threw our craft towards the Graveyard’s final obstacle a huge, partially submerged rock. We pulled hard, Mother Nature laughed at our puny efforts and within an instant we were facing each other. Our weakened canoe was wrapped around the rock. As I fought to push off the rock, Terry elected to roll out into the current. As he did the old blue Foxbat lifted up its tail and sank into the pool below the rapid. As he spoke, my old VW Kombi came winding around the corner loaded with our seconders and patching materials. It was a miracle that we met at this critical time on the 120km race. This merely proved to me that when we total commit to a goal, the necessary resources will miraculously be there for us. The kayak was broken in half, held together by a token strip of fibreglass and resin. As we began patching it with tree branches, duct tape and fibreglass, I reflected on the events of the past three days. This was my third attempt at the Dusi canoe marathon – an epic journey from Pietermaritzburg to Durban. I was ill-prepared on the first attempt and narrowly missed cut-off on a very dry river on the 2nd day of the following attempt. Terry and I were known as the “Heavyweight Champions” of the Dusi – based only on our weight and little else! We weighed a combined 210kgs which we packed, tightly into a 45kg canoe. This excluded drinking water, wet life-jackets and paddles! We had already covered about 100kms in the intensely oppressive January heat in sub-tropical Natal (KwaZulu Natal) and had according to our growing tradition and a lack of training, just made cut-off on each of the previous days. We had the strength and skills to negotiate rapids and the mental fortitude to handle long paddling sessions but distinctly disliked the many steep portage sections. In a full river portaging was the safest option, but we ignored the easy way – in pursuit of exciting paddling experiences.Now 20kms of paddle and portage lay ahead of us. There was plenty time left if the canoe was in good condition, but the need to carry the craft would make it difficult to get to the finish before the cut-off. e laughed at the fact that we, of all people, were carrying a canoe next to a perfectly flowing river. We occasionally forded the river, climbed hills and forced our way through “wag ‘n bietjie” (wait-a-bit) thorn bushes. I carried the front of the boat. Behind me Terry was beginning to stumble. Suddenly he and the Foxbat hit the deck. The canoe took on a definite and permanent banana shape! “Are you ok?”, I asked. “Ja.” came the response, “Just a little bit goofed!” Unbeknown to me the resin and catalyst were beginning to gel and the Terry was breathing in the hot fumes. He had never been that high in his life! After breathing in un-polluted oxygen for awhile we once more headed for the finish. Terry must have become accustomed to the fumes, or begun to enjoy the effects, as he never complained again.Eventually the repairs to our “banana boat” had set and we took to the water below the last rapids and paddled and emptied, paddled and emptied our way towards Durban. We ran out of drinking water and at times a severely dehydrated Terry seemed a little delirious. We met a group who gave us ice-cold drinking water, just when we needed it most.The news of the pending arrival of the “Heavyweight champions” had preceded us. Many hours later, with just 14 minutes to spare, we paddled our sinking canoe past hundreds of cheering spectators. We were stone last. As we crossed the line I silently began to cry tears of tiredness, elation and relief. 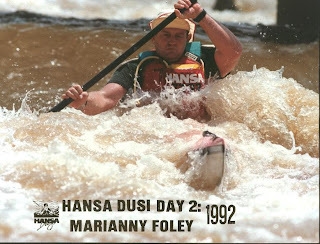 This was my first Dusi finish. We had done it! It is at these points in our lives that our destiny is determined. And it is then, when the Universe celebrates our commitment, and brings to us all the necessary resources to attain our goals. In the power of a decision lies huge opportunity. It is at times like this that we need to honour not only the people who receive the awards, but those who made it possible. To our supporters – the unsung heroes – thanks it is your giving and caring that makes all of life’s successes possible. Whatever stress you are under now – there is a still another “medal” to be won.Live in gratitude for the people who love you, believe in you and support you! Set your goal, patch up your “canoe”, and head for your next critical stage in your life. Together, you can do it! The annual South Africa Dusi Canoe marathon covers approximately 120kms of mountainous terrain and the courses of the Umsundusi and Umgeni rivers. The Kwa-Zulu Natal based race starts in Pietermaritzburg, and ends in Durban – 3 days later.